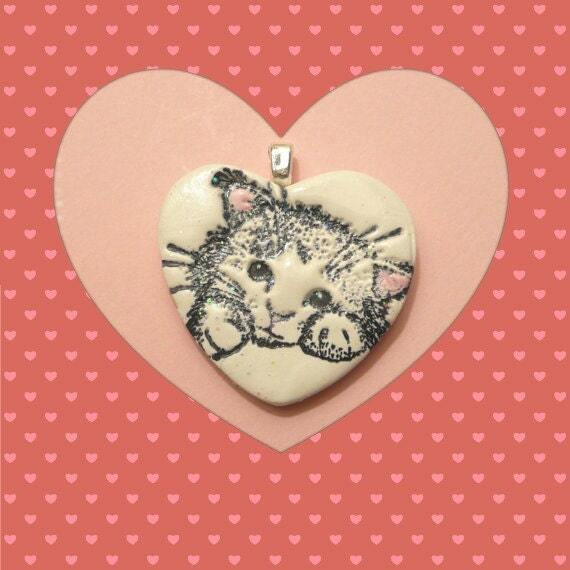 This little cat in a heart shape will make a sweet gift for any special occasion! - The kitty face is stamped in black ink on white polymer clay, with pink acrylic paint accents. Sealed with glossy acrylic varnish. - Measures about 1 1/4" x 1 1/4" (3.2 x 3.2 cm). - Finished with a small, silver plated bail to hold a chain, cord or ribbon. OPTIONAL: Add a pretty shiny silver plated 18 inch vintage style chain, with oval loops approximately 3mm x 4mm and a lobster clasp closure. See photo.